The Billionty-Oneth Geek: Hunting trolls with the TROLLHUNTER!!! Hunting trolls with the TROLLHUNTER!!! 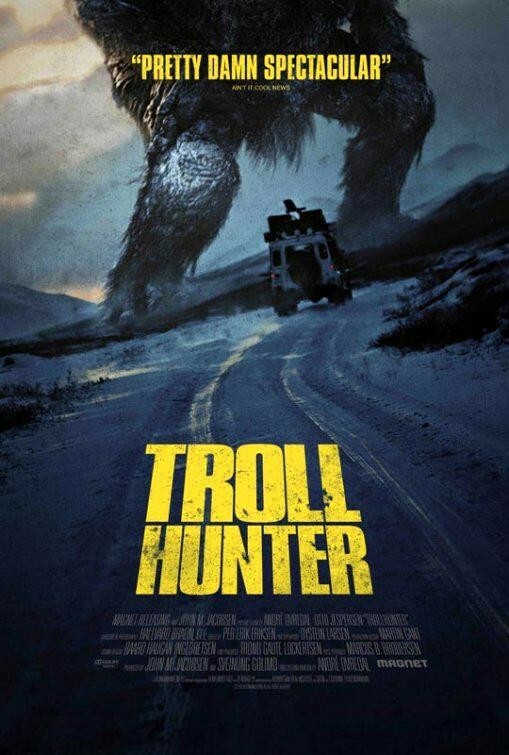 Troll Hunter is a mockumentary based on the troll hunting escapades in Norway. As such, it’s shot handicam style. The movie follows a group of university students filming a documentary about an elusive bear poacher in Norway. The students follow him despite his wishes to be left alone. One night they track him down to a forest outside of town, hoping to catch him in the act. The kids get more than they bargained for. Instead of catching him killing a bear, they find him being chased by a giant TROLL!!! It turns out he wasn’t a bear poacher at all, but a troll hunter! In an effort to cover up troll-related activity across the nation, the country has what’s called the Troll Security Service (or TSS), who act on reported sightings by killing off the destructive and giant-sized trolls. There is much humour, as the TSS makes public statements to the local press, pinning the blame for the damaged communities on bears, inserted onto the scene afterwards. The rest of the movie follows the students as they document the troll hunter and his journey to take down bigger and badder trolls. The movie has been a success around geek circles. It is certainly an entertaining movie. Great? I don’t believe it’s great, but it is new and original. Probably the greatest aspect of the movie (to no surprise) is the trolls, which seem to be a mash up of CG work and practical effects. Whichever it is, they look great on screen. They have a realistic, yet goofy look to them, if that makes any sense. Like Carrot-Top. He’s also a realistic person, but he looks goofy, right? The trolls in this movie look like something out of a fairy tale story, but brought into real life. I’m not really familiar with troll folklore or mythology, but apparently they can smell the blood of Christians and will dispatch them on sight. It’s amusing but does not bode well for me and my brethren. However, oddly, God believers of other faiths are exempt, confirmed with a hilarious scene where they hire a Muslim videographer. Whether it’s really good or bad, at least it’s a breath of fresh air into genre filmmaking. There’s too much vampires, werewolves and zombies, it’s about time we got ourselves some trolls! Until next time, later geeks!